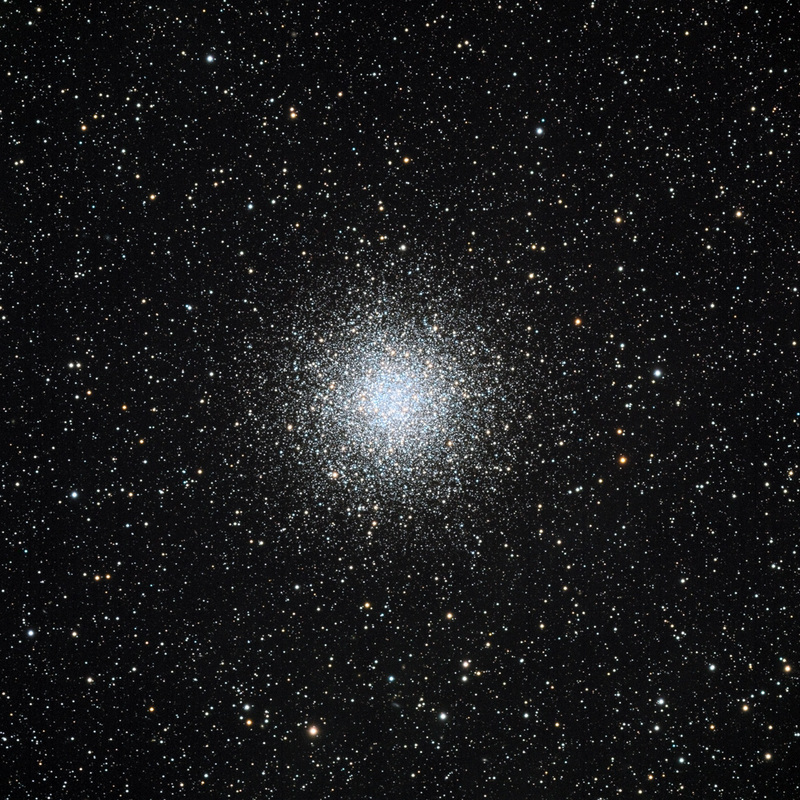 Globular cluster M 55 in Sagittarius is an often overlooked object in favor of its spectacular, nearby neighbor M 22. It’s one of the tougher Messier Marathon objects to find visually from northern latitudes due to its relatively low elevation in the sky and lack of nearby bright stars from which to navigate to M 55. Even when located it’s generally not a spectacular visual object due to its low surface brightness, however very large aperture scopes in dark-sky locations or long exposure CCD imaging bring out the true beauty of this fine cluster. Lying about 17,000 light-years from Earth, M 55 spans nearly 100 light-years across and contains well over 100,000 stars. Of particular note are the vivid bluish stars in the main body of the cluster known as Blue Stragglers, odd stars that belie their ancient vintage. They are in fact old stars that appear younger, bluer and more luminous than similar stars their age as a result of interactions and mergers with neighboring stars in the cluster. M 55 was discovered by Nicholas Louis de Lacaille in 1752 while observing from South Africa. Charles Messier, on whose list this object appears, failed on several attempts to observe it from Paris, finally succeeding in 1778 from that far northern location. Total exposure time was 2 hours 45 minutes. This image is the result of a collaborative effort between Howard Hedlund of Astro-Physics, Inc. and Dave Jurasevich.